This has been a really tough year for me and my family. 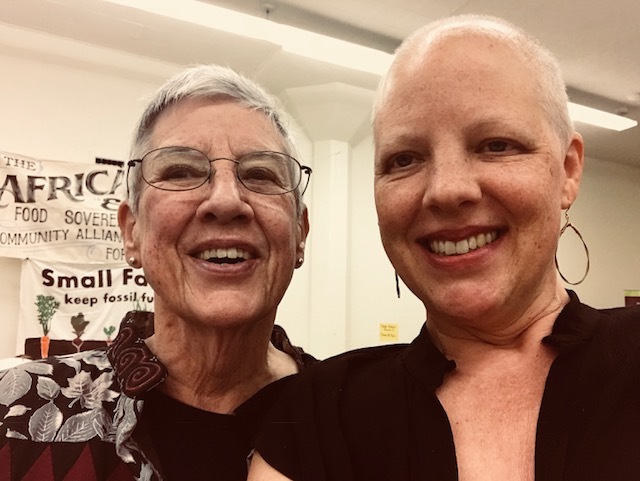 I was diagnosed with stage 2 breast cancer on March 31, and started 5 months of chemotherapy in May, followed by surgery in November, and 7 weeks of radiation, which began this month. The good news is that there is now no evidence of disease in my body, but I face years of living in fear of a recurrence. I am really proud of how much CAGJ has accomplished this year, despite the fact that I worked less than usual throughout treatment. Our organizing has continued thanks to Simone Adler, CAGJ’s amazing Organizing Director, and our fabulous Members who volunteer their time and donate funds to make our work possible. Please add your voice to CAGJ’s call for global justice by making a tax-deductible contribution today. One of the things I have been meditating on since being diagnosed is how our food system is making us sick, and is probably one of many reasons I am facing this scary disease.Suddenly so much of CAGJ’s work feels very personal. The news is full of stories related to the food-cancer connection; just 2 examples are California’s efforts to classify Monsanto’s Round-Up as a carcinogen, and France and Italy’s plans to ban the herbicide glysophate in the next three years. Given Monsanto’s particularly devastating influence on our food system, the Gates Foundation’s ties to this agro-chemical giant in Africa enrage me even more than they did before, especially their support of new laws that facilitate the introduction of genetically engineered crops on the continent. Donate today to help our AGRA Watch campaign hold the Gates Foundation accountable, and support the African food sovereignty movement. The Food Justice movement has always had health disparities and environmental racism at the center of the reason we must mobilize. But before I got sick, I did not feel as personally affected, nor did I realize that there is a breast cancer epidemic: one in eight women is diagnosed with breast cancer in the US. The focus of the pink-ribbon-movement is on a cure, while the environmental causes need more attention. So while I may have been slowed down by cancer this year, I am profoundly motivated to keep fighting for Food Sovereignty and Food Justice, because I now know, more than ever before, that our lives literally depend on our success. Please make a tax-deductible end of year contribution today to help CAGJ strengthen these movements in 2018 and beyond. Finally, I want to thank you, my beloved CAGJ community, for helping to keep me, Travis and Henry strong with all of the love, meals, and well-wishes. Another World Is Possible! Let’s make it real in 2018! P.S. CAGJ’s Sustaining Members are the best! Please consider making a tax-deductible monthly donation, and help us reach our year-end goal of $3000 annually in new Sustaining Members. Me with my mom at this year’s SLEE Dinner!